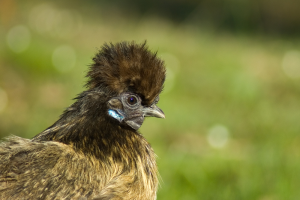 There is not much about the history of the silkie bantam but there is no doubt it is a truly ancient breed with Eastern roots. 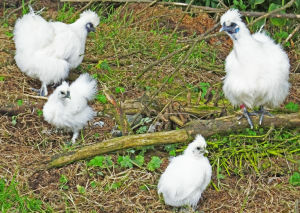 Silkie Chickens are yet another breed that we have Asia to thank for, with the most notable early documentation of them being from ancient China, with some contribution from Java and India. During his travels in Asia dating as far back as the 13th century, even Marco Polo tells stories of his sightings of oddly furred chickens. 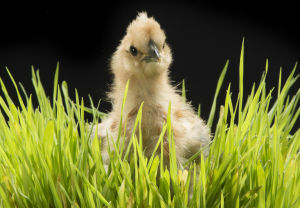 It was not until the mid-1800s that Silkie Chickens had made their way into the West. By 1872, they finally made their debut into the American Standard of Perfection, and have been quickly gaining in popularity ever since! "Quite small, rather hairy and good sitters and mothers. Early writers called them the woolly hen and their native land was Eastern Asia. Their skin and bones are blue black or purple and they make a distasteful dish for the table. They have 5 toes and white plumage." 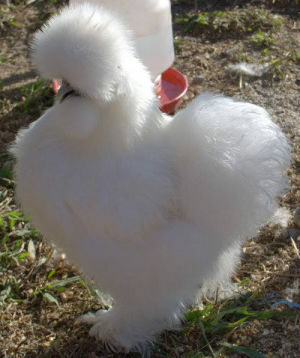 Below: Silkies of old were always pure white. "The variety is very beautiful. Her Majesty, if we recollect right, has beautiful specimens of these bantams." No one is quite sure when Silky became Silkie. As to the origin of the fowl there is very little information. In old writings it is sometimes called the "Japanese Silky", but whether we owe it to that country or not it is difficult to say. It has been known for hundreds of years in Europe, and is mentioned by some of the early writers on domestic fowls. 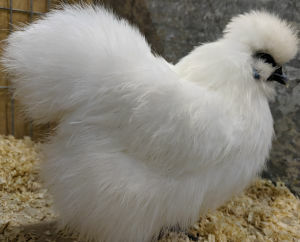 "Japanese Silkies are a very excellent variety, of good service as winter layers, and having hardy constitutions will live and do well in any small pen in a garden or yard, while as mothers or nurses of Bantams, pheasants, or the more fragile breeds of poultry, they simply stand unrivalled." The Silkie even appears in writings by Darwin but this throws no light whatever on the question of its origin. 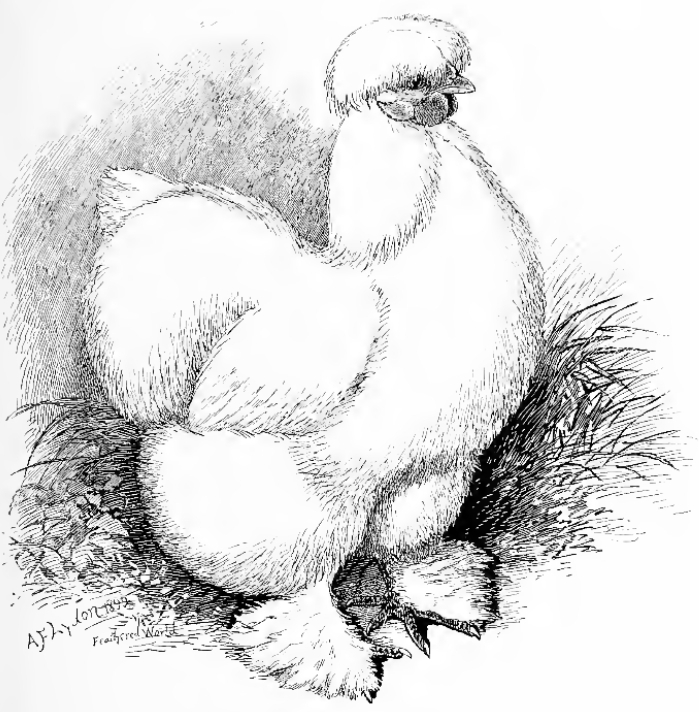 Of the many quaint varieties of poultry the Silkie takes a leading place, both on account of its antiquity and the peculiarities which separate it from other breeds. The leading difference is that which gives to it the name it bears, namely, the fact of its feathers being more like fine hair than is usual for plumage on all kinds of birds. This peculiarity is occasionally met with in other breeds of poultry, but only as a sport, and this is the case more especially in what are termed soft-feathered breeds, such as Cochins and other Asiatics. The appearance is very peculiar, and the bird looks as if it were covered with fur instead of feathers. Below are some quotes from poultry books written before 1900. "A further peculiarity is seen in the colour of the skin and flesh, which is of a deep violet, almost black, whilst the face, comb, and wattles, are of a deep blue or purple colour, with legs and feet bluish black." "It is the only fowl which base colour of flesh or skin of this kind, for one of which we have heard in Ceylon is probably of the same family, and when cooked there is no less tempting bird to be seen." "Looks no more make the fowl than the coat does the man, and the flavour of the flesh is excellent. The white, silky feathers, relieved by dark purple flesh." 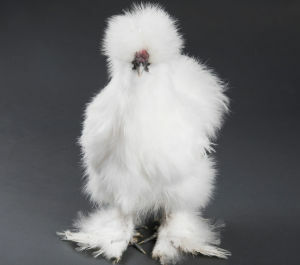 For exhibition, Silkies should be quite white, have a nice round globular crest, are five-clawed, feather-legged, but without any trace of hocks. They should have small, round, knobby combs, black or purple, turquoise blue ear-lobes, and be as free from long sickle feathers as possible. They are of moderate size, and shaped as much as possible like a good Cochin, and with the plumage as silky as can be obtained.